1. Preheat the oven to 200° and line a baking sheet with paper towel. 2. Spread out spiralized zucchini onto the sheet. Sprinkle with salt. 3. Cook in the oven for 30 minutes. 4. Once done, remove and squeeze with the paper towel to get as much water out of the zucchini as possible. Keep warm. 1. Add all the above ingredients into a food processor and process until fully combined and creamy. 2. Toss with the zucchini noodles and set aside. 1. Heat olive oil in a pan over medium-high heat. 2. Once hot, add in the tomatoes and let sit for 2 minutes. 3. Give them a stir and let sit another two minutes. Turn heat down if they are burning too much. 4. Once they are charred, turn heat down to a simmer and keep warm. 1. Heat olive oil in a pan over medium heat. 2. Sprinkle salmon with salt and pepper and then place on pan. 3. Cover and let cook for about 6 minutes or until cooked. Keep warm. 1. 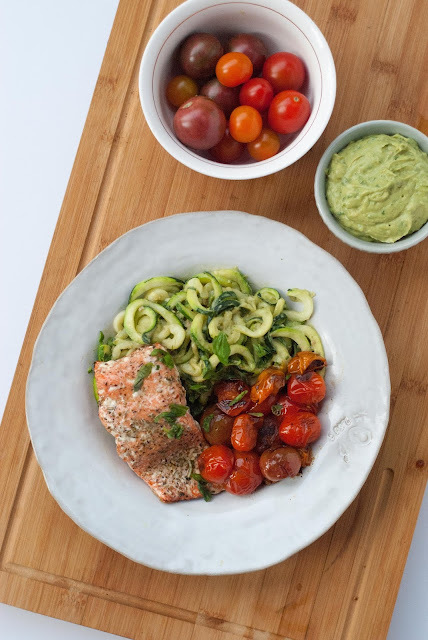 Place zoodles, tomatoes and salmon onto your dish. Top with fresh basil. Enjoy!